Quest for Inter-City train: I have previously gathered new parts and started to catalog old parts for re-creating the 7740 Inter-City Passenger Train. I have also made a few BrickLink acquisitions, including the 12V transformer. My use of old childhood parts will be far more limited on this set than on the Lion Knights’ castle (my other similar “quest”). Half of the train will be new parts (by choice), most of the rest from BrickLink (not by choice). Whatever little old parts I will re-use, come mostly from the 7710 Push-Along Passenger Steam Train and other 1980s LEGO Town sets. I have discussed excavating and searching my old childhood LEGO collection sufficiently before, there isn’t much to report there. It is still dusty as heck and in terrible need of some sorting. 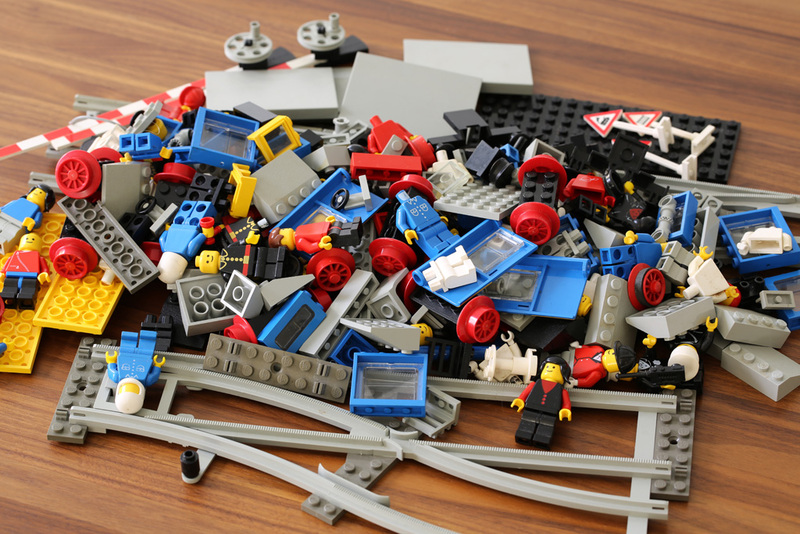 That said, here is a photograph of some vaguely LEGO Trains related parts I have put aside as I have gone through the storage containers. I also expect to need some of the basic, old light grey bricks I have readily sorted, thanks to the 6080 King’s Castle build.